Sleep soldier boy sleep on | How Goes the Battle? We patrolled all day long. One day you’d be on ambush, one day on guard and one day on listening post. It kept rotating, seven days a week, never a day’s rest. 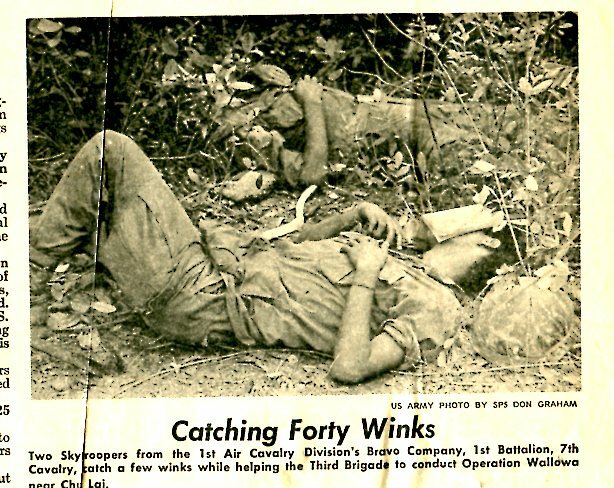 Patrol all day long, then when you’re on ambush your squad or platoon was up all night then all the next day to patrol. Days without rest. When you did sleep, it was three hours at a time, you’d wake up with leeches all over your body, pull them off your eyes, mouth, they were everywhere. Always tired, always pushing, no time to rest. I climbed Tiger Mountain and when I got to the top, I was shaking so bad they had to lift me out by helicopter. I was hospitalized for 72 hours due to exhaustion. I didn’t wake up the whole time.